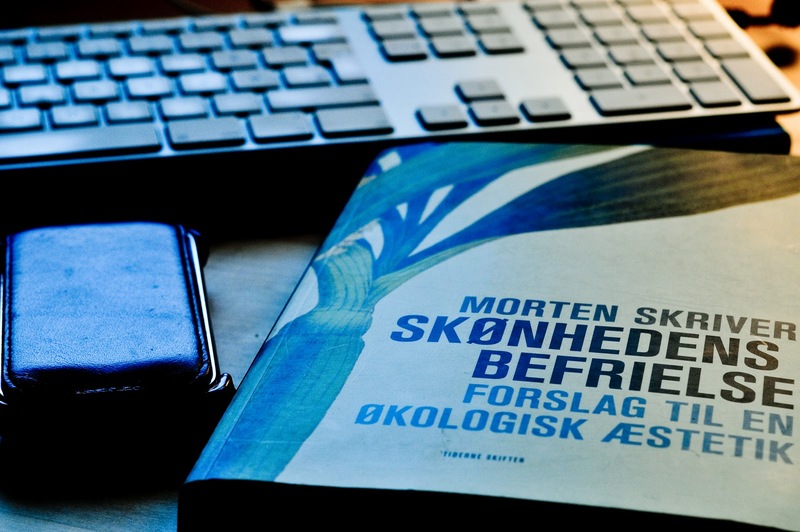 on a friend's recommendation, i acquired a book called skønhedens befrielse - forslag til en økologisk æstetik (liberating beauty: towards an ecological aesthetic) by morten skriver. a book by a guy whose last name is actually "writer" has to be ok, right? i felt the book started off well. it really spoke to me with its condemnation of the horrible conditions under which animals are mass-produced for our consumption and of the mind-numbing sameness of suburbia and mall culture. and the underlying message that we must return to a place where we see that everything is connected to everything else and the choices we make matter is a good one. but. (you knew it was coming, didn't you?) but, then i began to notice that citation of sources was sorely lacking. i came across ideas and thoughts that i know i've read before other places (thomas friedman, al gore, denis dutton), but no credit was given. granted that these are not presented as quotations, but neither are they original thoughts on the part of mr. "writer." i think mr. writer might have needed to work with a guy named mr. editor, who should have flagged this fact. a book like this is very thought-provoking, but it makes me want to read more. i want to know who he has read - i want footnotes and end notes and a bibliography. because i'm certain a lot of research went into this book and it totally spoils it for me that citation of sources is completely lacking. does he really think ms. reader will believe he came up with all of this himself? no way. and once these doubts about him crept into my mind, i began to see that many of his conclusions were rather wild as well. he lays out good examples of how our consumer society has pushed us very far from an aesthetic and ethical way of living but then he tacks wild, leaping conclusions onto them. he uses the example of the golf course and the uniformity and ubiquity of golf courses as an illustration for what's wrong and how far we are from nature. i think it's an interesting example, but i'm not sure it proves what he thinks it does. because i don't think that people golf to be somehow closer to nature - they golf for the sport and the competition, not necessarily to see grass, trees and sand traps. the notion is interesting, but his conclusions are all off. but i keep reading, hoping i'll be able to see the sources between the lines, so i can go directly to them and read even more. because i think that this notion of a return to a more natural state is indeed a way of both liberating beauty and being liberated by beauty and i think it's related (tho' i don't yet know if i can explain how), to this renaissance of craft and handmade. we are looking to turn away from the soullessness of the mall and the giant supermarket and get back to something that feels more real and more beautiful - even if it's just rhubarb from our own garden or curtains we sewed ourselves. we are turning away from the mass produced and towards the unique and beautiful. but, mr. skriver, shame on you for not citing your sources. you've done yourself (and your name) and us a disservice. more than disservice, it's actually downright plagiarism. You constantly amaze and inspire me...Reading a book of that size and subject takes work! In the midst of all you are up to you make time to read. Very impressive. I think you must have a very fast mind....Your conclusion was thought provoking...having moved out of the city to the wild wild west, I'm just becoming aware of the to the mass marketing hype that was everywhere...I take great pride in my new bathroom curtains, but haven't planted my rhubarb yet! you're a better woman than i, for sure. I'm with you-- Give credit where credit is do. And I agree, a more natural state-- even with small things, will add up and make a difference. You read with an analytical mind. Some people just gobble it up as truth without questioning the source. You're very much like me in your curious and questioning nature. I've grown to not accept everything as is and research into it, my science degree actually encouraged nothing less. It's ashame there weren't any references or citations for you to get stuck into. It's always nice to give recognition where recognition is due and refer back to any concepts that weren't yours. The bad thing is there are people who will accept what is presented to them in books, newspapers and the internet no questions asks. This is big style plagiarism! If this was a dissertation or a project with no citing of sources, it would be big trouble as many markers would refuse to grade it at worst, at best - a fail.